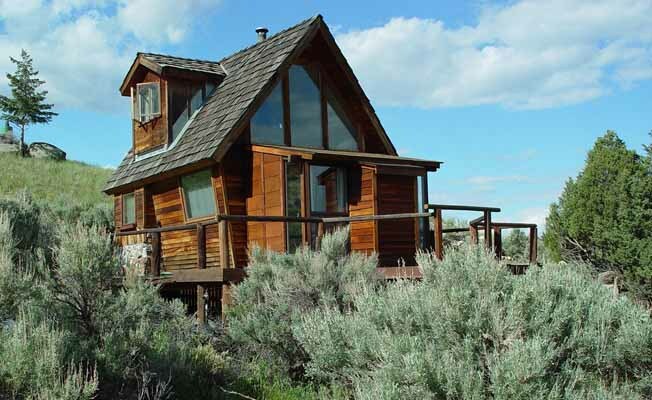 The Yellowstone Country Cabin is ideal for two to three people. It is nestled at the base of Crystal Cross Mountain in Paradise Valley Montana. The cabin is only five minutes from the Yellowstone River and 17 miles (20 minutes) from the north entrance to Yellowstone National Park. Our 500-square-foot A-framed cabin was completely renovated in May of 2005. Everything is fresh and clean. The beautiful kitchenette has a two-burner stove, coffee maker, toaster, toaster-oven, and microwave. You can enjoy your meals at the corner dining booth. The sunroom has a sofa bed, satellite TV, VCR, videos, and games. The bathroom has a tub/shower with towels provided. The loft bedroom has one king size bed and a large dresser. Upon request, the king bed can be separated into two twin beds. Outside you will find a secluded area to grill your catch of the day, warm up by the bonfire, and soak in all the splendid, towering mountain views.